According to academics at the University of Sheffield, new information about how animals spin silk could pave the way to new, greener methods of creating synthetic fibers. A team of Researchers from the University of Sheffield's Department of Material Science and Engineering have demonstrated that animals spin silk by pulling rather than pushing it out of their bodies. They propose that if this process can be copied in an industrial set up, it could enhance how synthetic materials are processed and offer more eco-friendly substitutes. Conventional synthetic textiles are manufactured by extrusion - pushing a liquid feedstock via a dye and then using high variations in temperature and exposure to strong chemicals to solidify. However, silk can solidify into a fiber at room temperature, leaving behind only water - thus causing less environmental damage. The new research, by academics at the University of Sheffield, has been published in the Nature Communications journal. Silk is one of the most promising green biomaterials, and could be the perfect replacement for nylon and polyester based clothing. Traditional production process for silk is both arduous and time-consuming, but if we can bypass that by mimicking nature in an industrial setting, we could improve not only silk, but also how we process our synthetic materials. Researchers studied how animals, including spiders and silkworms, push materials like silk out of their bodies. While it is easy to assume that silk is propelled out of the body like we see in comic books, we wanted to put that to the test. Dr Holland added, "By combining computer models with experimental data and practical measurements, we determined the forces needed to squeeze unspun silk down the animals' silk gland and spin a fiber." 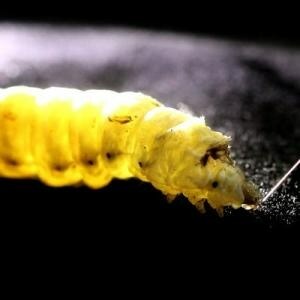 Jamie Sparkes added, "We found that to spin silk by extrusion (pushing), means a silkworm would have to squeeze itself hard enough to generate more pressure than a firing diesel engine. This isn't possible as the animal's body would be unable to contain that pressure. It seems that you can't squeeze silk like a tube of toothpaste." However, by measuring the forces essential to pull silk from the animal's body, the team discovered that it was easily within the capability of the silkworm to pull a fiber, a process they call as pultrusion. The Researchers accomplished this by adapting a rheometer, a machine used typically to measure the viscosity of liquids, into a very sensitive spinning wheel, capable of measuring the forces required to spin. If I gave you a piece of chewing gum and asked you to make me a fibre, you wouldn't push it through your teeth as it's too stiff. You'd grab one end and pull it out - and that's what the silkworm and spider do.